Album Title Níl Gar Ann! other information Cairdeas na bhFidiléirí CNF 005, 2008. A compilation of recordings dating from between 1946 and 21 July 1967. Notes by Rab Cherry, Dermot McLaughlin, and Tomás Ó Beirn. 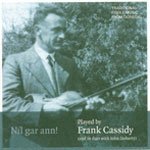 Tracks 10, 19, 23, and 26, recorded as recently as 1992, are of other people talking about Frank Cassidy. Tracks 14 and 33 are of Frank himself talking. Also not indexed here: track 20 (Beautiful Ohio).